Here is another version of the birthday cake pop-up card. My other one was done in primary colors and used the Pennant Parade stamp set, so I wanted to come up with something different. Here it is - what do you think? Using the Delicate Doilies stamp set, I started with Wisteria Wonder cardstock and dye ink, stamping an overall background on the front. I made the little "medallion" by stamping the doily onto Whisper White cardstock and punching it out with the 1-1/4" Circle Punch. The 1-3/8" Circle Punch was used to punch some Pretty in Pink cardstock, and then the 1-3/4" Scallop Circle Punch was used with So Saffron cardstock. 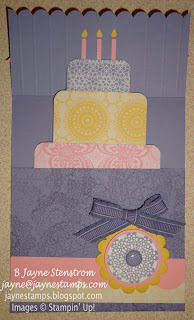 The finishing touch was using a Designer Printed Brad in Wisteria Wonder in the center. The cake is made with Designer Series Paper from the Flirtatious Specialty pack. The candles are from the Cupcake Builder Punch. In this picture it's easier to see the score lines on the top flap. Those were scored with the Simply Scored Scoring Tool (love this!) in each indentation that was made by the Scallop Edge Border Punch. The saying on the top flap is from Curly Cute. After it was stamped, I made the "banner edges" by turning the 1-1/4" Square Punch on the side and punching off a triangle. I layered it onto Pretty in Pink cardstock and just free-hand cut for the banner ends, following the triangle on the Whisper White. The finishing touches were made using the Tasteful Trim Bigz XL Die and also adding a bow tied with the 3/8" Ruffled Ribbon in Wisteria Wonder. It looks totally different from THIS CARD, don't you think? Much more feminine.